When do kids start reading? That depends. 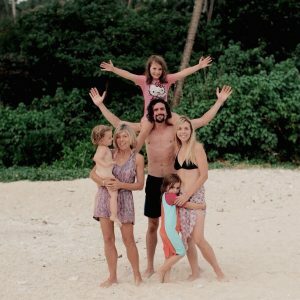 Our close friends and family know that we’re massive hippies and that our kids don’t go to school, and that we follow a philosophy called ‘autonomous education’ or ‘unschooling’. Some are fellow unschoolers, others are happy to watch us carry on, and some are probably watching in quiet horror but love us anyway, and we are grateful and thankful for all of their presence in our lives. Unschooling is a philosophy based on the premise that humans are hard-wired to adapt and learn for their progression. It suggests that when provided with good supportive conditions, children will flourish and learn all that they need to in the same way that they learn to walk and talk when they are babies. It doesn’t mean that we reject all structured education, far from it. It simply means that structured education such as lessons is seen as an optional resource, to be chosen and engaged with by the learner, as opposed to being forced onto them. Unschooling reading is simply one outworking of the philosophy. 3 Q: When do kids start reading? A: When they’re ready. 4 Q: When do kids start reading? A: When they need to. As far as I can tell, there is really no reason that as a society we jump at the age of four from free-play in forests and at craft tables and elbow-deep in flour in the kitchen, to forcing children to do things that they aren’t interested in. Other countries with a much later school starting age and more relaxed, child-centric learning philosophies have far better outcomes than the UK so it is strange that we haven’t followed suit. Patrick and I decided a long time ago that we would do things differently. People are often interested in our way of doing things, particularly as it is very counter-cultural and ‘unschooling reading’ is seen as a huge risk. We are told from a young age that if we don’t have lessons then we won’t learn to read, write, do maths, etc. This, thankfully, isn’t true. The main issue with unschooling reading, or indeed unschooling anything in ‘normal’ society is the fact that natural learning happens at a hugely variable rate compared to when children have compulsory lessons. Some things will be picked up and understood in an instant and some things will happen very slowly, and of course the rate will depend on each individual child. This is hard to swallow when we are being judged as parents based on the potential economic output of our kids and when children are seen as a reflection of ourselves (something I also encourage people to question- they are a whole, complete person, not a secondary version of us). It is because of our own egos that we push kids to do more, quicker, and keep up with the crowd. It is hard to disentangle our egos from our offspring when children are seen as property and our property, according to warped measures of success, tells people about how ‘well’ we are doing in life. People are also understandably concerned that their child won’t learn to read if they don’t have compulsory lessons, especially as children in the UK are taught at age 4-5 and a child who doesn’t attend school (or, indeed, attends a school in the Netherlands) often still won’t be reading fluently at age 6 or 7. Having read myself to death life on the subject of child development/psychology/education- (and here comes the Irony Fairy: I quit my degree in English and Child Development partly so that I would have time to thoroughly educate myself about it)- and having met loads of families who are autonomous and unschooling reading, I’m very confident and happy with the idea that allowing a child to find their own path is a safe and joyful option for their education. Q: When do kids start reading? A: When they’re ready. None of our kids have ever been to nursery or school, and they have always been given 100% free choice over any lessons that they attend. Our eldest daughter aged 6 chose to have some reading and writing sessions with a lovely, chilled-out tutor a few months ago; apart from that her progress in literacy has been completely environment-based. We read to her, she picks up books and gives it a go, we help her write cards and letters to her friends and we write out stories and emails that she dictates to us. It’s all part of nurturing a love of literacy and a confidence around the practise to give her a solid baseline from which to progress. ‘Not teaching’ her to read doesn’t mean ignoring literacy; it simply means facilitating the learning rather than imposing it. Nope. Unschooling reading means she hasn’t missed out for a second; she has been surrounded by them since she was born. I have photos of me reading Harry Potter to her as a newborn (bit weird but yeah I did that); I’ve always made up stories and fantasies to stir her imagination. She has audio books, Patrick and I read to her, she has follow-along books with audio narration and pictures and words. When she wants to Google something she gives the spelling a go herself and asks for help when she needs it. She plays Minecraft and learns what words say through direct context. She sits with her sisters and they help each other, figuring out letters and deciphering them in an immersive and freely chosen game. There are a million ways of bringing reading and a love of it to a child’s life- force is not necessary. Q: When do kids start reading? A: When they need to. This may not seem like a big deal for most parents- most school kids her age (6) in the UK can read books fluently, so a lot of parents would see the fact that this was noteworthy as a source of embarrassment, even shame. I’m thrilled. I’m thrilled that she thought to pick up the menu out of curiosity and that her confidence was completely intact despite not reading fluently. I’m thrilled that she tried to read. I’m thrilled that she read it, and that it was a word that she’d never seen before. I’m thrilled that she was interested enough in deciphering the word to ask me what it meant, and that she trusts our relationship enough to reach out and ask questions, knowing that I will respond and help her. Her education is joyful and completely self-motivated, while being led and guided by us as her parents. It is dynamic and freely chosen and relevant to herself as a unique individual. She has chosen to read because it is relevant and adaptive for her to read, because it is a useful tool in exploring the world. And she will have the huge gift of being able to read as well as the even bigger gift of autonomy, of having been given the choice as to how and when and what to learn, and the complete ownership of her own mind and knowledge. That is quite aside from the fact that she is growing up knowing that she is enough, just as she is- that no grade or speed of learning or skill or tidbit of knowledge is ever going to increase her worth. I am hopeful that she progresses and grabs learning opportunities with both hands, and says ‘no thank you’ to those things that are irrelevant to her, so that she may become stay exactly who she was meant to be when she was designed. If you found this post interesting you may also like our other posts about home education and parenting. The love you have for the girls is so evident and so lovely. I’m so happy you all are able to do this as a family?